There’s something about the scent of boiling water in the summer. I know, water in and of itself, has no scent. I’m talking more about how the steam clings to everything, making the air feel heavier than it is already. When I set out to do this, I feel a bit crazy, but cooking seasonally is about seizing the moment. Here in the northeast those moments feel so fleeting. 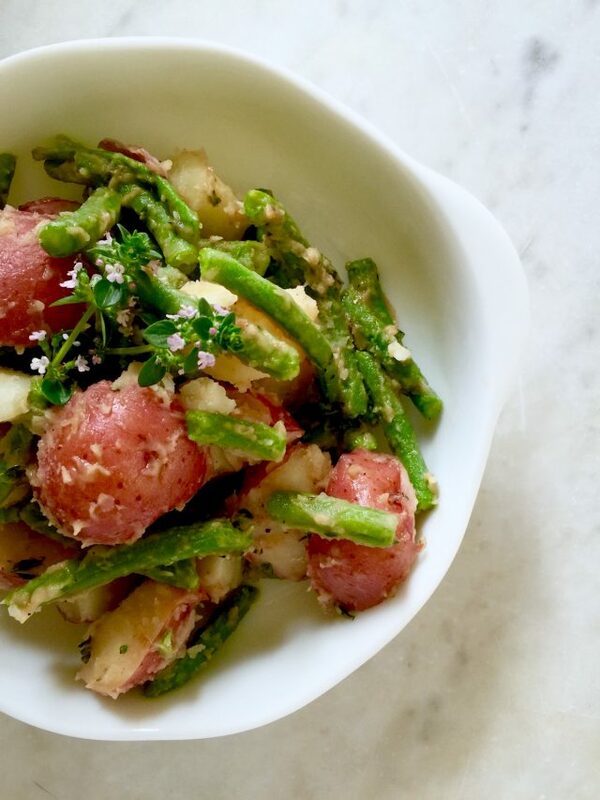 So, when I saw fresh string beans at the farm stand a couple of weeks ago, my mind drifted to a pot of boiling red potatoes to make this Italian String Bean & Potato Salad. They don’t seem to go hand in hand right away, potatoes and green beans, but for me they do. 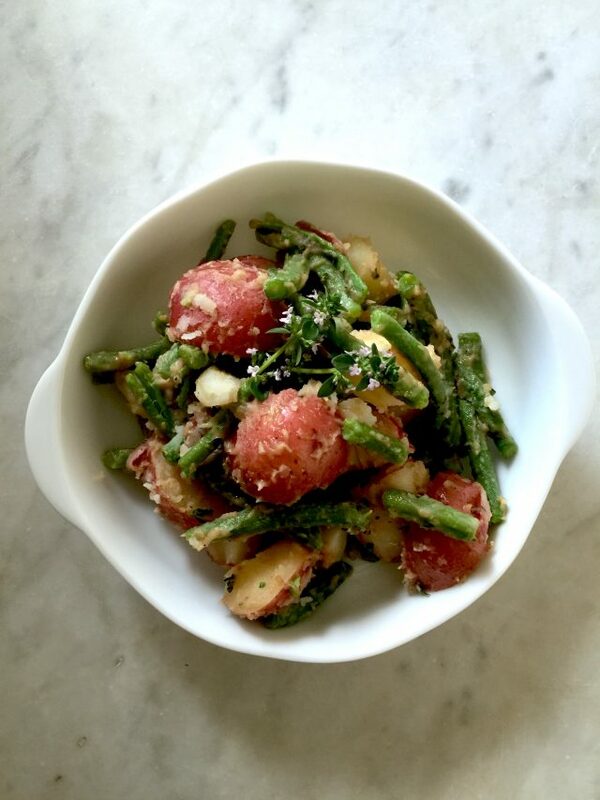 My mom used to make a dish of boiled green beans and potatoes, cloaked in a red wine vinegar dressing. Of course, I never ate them as a kid because I subsisted on pasta with butter, sicilian salami, and peanut butter & jelly sandwiches. In fact, I couldn’t even tell you what her dish tasted like. I’m not sure she even cooks it herself anymore. What I can tell you is that I love all the ingredients that now go into that dish. I don’t remember if she used red or white potatoes, but I decided to use tiny red potatoes for this version. I picked ones small enough so they just needed to be cut in half. You can go even tinier, and skip the need to cut all together. Regular string beans will do just fine, but if you happen to see roma beans you should give them a try. Think of them as a flat green bean. The outer skin has a fuzzy feel but that fades away once cooked. Unlike other vegetable dishes where you want the end result to have some firmness, this dish calls for almost complete surrender. You want to cook the beans until they’ve practically given up, but still retain the tiniest of bite. 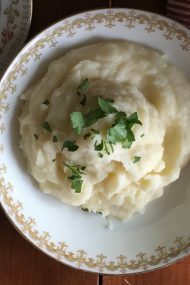 The potatoes should be soft enough to mash the tines of fork into them, and yet firm enough so they wouldn’t make a smooth mash if you tried. It’s like so many things in life, a delicate balance between just enough and going too far. You want “just enough” for this recipe. To manage the cooking times, and keep it to one pot, I give the potatoes a head start. Let them cook at a rolling boiling for about 8 minutes before adding the beans. Once you add the beans to the pot, another 8 minutes should do the trick. My mom’s dressing was thinner, tinged with a heavier vinegar scent than the one I’m sharing a recipe for today. If you want to make it that way, just douse the potatoes and beans with some olive oil, red wine vinegar, finding the ratio of oil to vinegar that works for you. Salt and pepper, of course, too. It really couldn’t be any simpler, or satisfying, for me at least. The main thing is to dress the salad while it’s still hot so the potatoes can soak up the oil and vinegar. Since I’m in recipe development mode for work, I decided to use the Red Wine Vinaigrette from Dress It Up Dressing. 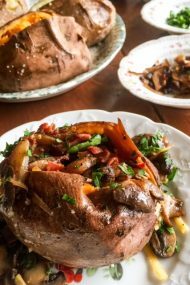 The dressing is full bodied, and when mixed with the hot potatoes, it thickens up even more, clinging to the beans and potatoes. The end result reminded me of a more traditional potato salad, without the mayo. I plucked a few stems of lemon thyme from the garden, and chopped up the leaves. They add a citrusy lightness to the salad. I also added a few thyme flowers for garnish. You can certainly swap in other fresh herbs, too. Oregano, dill, chives, and parsley would be great. I’m curious about sage, and almost used it here. Do tell me if you give it a try. Even the tops of fennel would be nice, and a great way to use up the fronds. 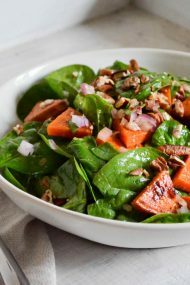 I love eating this salad warm, or at room temperature. Since it contains no dairy, it’s perfect for picnics—no refrigeration required. You should store any leftovers in the fridge, though, and they’ll keep for a few days afterwards. Oh, one last note. I call for lemon salt in this recipe. I’m going to share that easy DIY tip soon. Until then, swap in a combination of flaky sea salt and fresh lemon zest. Bring a 4-quart pot of water to a boil. Salt the water. Add the potatoes, and cook for 7 to 8 minutes, until you can just pierce them with a fork. Add the beans, and cook for 8 more minutes, until beans are very tender but still have a bright green color. Drain potatoes and beans. Add them to a deep bowl. Spoon in the dressing, and stir to coat well. Stir in the lemon thyme. Season with salt and pepper. Serve warm, or chilled. French Potato Salad | Creative Culinary | A Denver, Colorado Food and Cocktail Blog featuring fresh, homemade, seasonal recipes for food and cocktails. How sweet that your mom commented! Love that! I’m eager to see how you make lemon salt.